Ultimately you can write programs for any model of AVR using Eclipse but note that if you are using "plugins" that "know" the AVR models and perhaps allow you to select them from a drop list then those may not yet have been updated for newer models (so you may have to find some way to over-ride what they are selecting - presumably the input value for -mmcu= ? Offered in a compact 3 x 3 mm 20-pin QFN package, the new ATtiny1607 family is optimized for space-constrained closed-loop control systems such as handheld power tools and remote controls. In addition to the integrated high-speed Analog-to-Digital Converter (ADC) that provides faster conversion of analog signals resulting in deterministic system response, the devices provide improved oscillator accuracy, allowing designers to reduce external components and save costs. ... and pricing for the ATtiny1607 family starts at $0.56 each in 10,000-unit quantities. edit: but do they have an ADC? I don't see it here, but it's in the datasheet. Or maybe ONEs that had some flash or RAM problems and they become ZEROS? Where is the ADC in the Tiny1607 comparison in post # 355 but mentioned in the press release of post # 354? I copied that from Microchip's site, I think they forgot the ADC but it exists. At least it's in the datasheet. I have designed a Offline Autoprogramer can support UPDI interface to program ATTINY816/817......with updi interface. if you interest this, please contact me. I guess it comes down to yields... ? They say it's a documentation change only, the product is the same. I guess things just get tough @ 125 ºC and they just can't risk guaranteeing operation above 8 MHz. 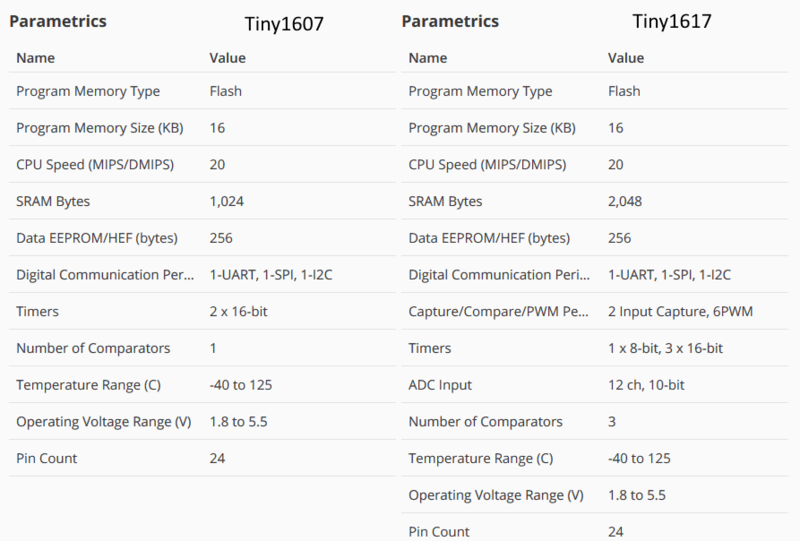 tiny1607 is in-stock at Digi-Key. Mouser should have a bit of stock tomorrow. For evaluation purposes, the ATtiny3217 Xplained Pro evaluation kit is also available. The ATtiny3217 Xplained Pro evaluation kit (ATTINY3217-XPRO) is available now for $38 each. 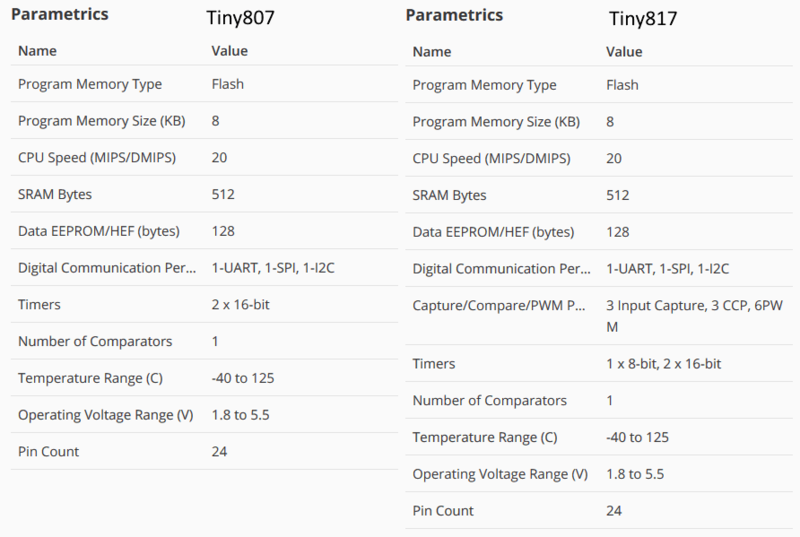 Mouser has ordered tiny3216 (both temperature ranges) with an ETA of 14-Jan'19. Microchip Thailand will be the second assembly site for some tinyAVR 0 and 1-series. Product Change Notification - LIAL-30BVKD482 - 17 Sep 2018 - CCB 3321 and 3321.001 Final Notice: Qualification of MTAI as an additional assembly site for selected Atmel products of the 59.91k wafer technology available in 20L VQFN package. Product Change Notification - KSRA-03CTPA224 - 07 Nov 2018 - CCB 3586 Final Notice: Qualification of MPHL as an additional final test site for selected Atmel ATTiny1616 device family available in 20L VQFN (3x3x0.9mm) package. Unlike Xplained series it supports all MCUs with corresponding protocol. It can be roprogrammed to UPDI ,ISP, TPI, SWD. Maybe it will help somebody. Product Change Notification - KSRA-12MQWI134 - 22 Mar 2019 - CCB 3743 Initial Notice: Qualification of MPHL as a new final test site for selected Atmel ATTINY416 and ATTINY816 products available in 20L QFN (3x3x0.9mm) packages.